Harper's first run of a Hillerman paperback, accomplished through Harper Paperbacks, a division of Harper & Row, Publishers, Inc. The full color graphic over a white ground was done by Peter Thorpe, who began collaborating with Hillerman on his cover art in 1986. The front cover shows an illustration of a mesa-top pueblo flanked by two Joshua trees, and overlaid by an emblazoned cow skull. 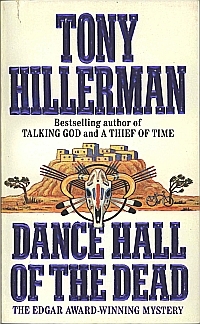 Almost twenty years after the first publication of Dance Hall of the Dead, the outside and inside covers of this paperback edition are covered with praise and references to Hillerman's many titles and awards, including a black-and-white photograph on the inside back cover. Binding: Paperback with full color illustrations on front and back covers. Inside front cover displays publisher's mark, ISBN number, and barcode, while the inside back cover shows black-and-white photograph of Hillerman and a list of awards earned by Hillerman's writing.